I’ve said it once, and I’ll play it again, Sam. The mere sight of the Paris rooftops at l’heure bleue has never failed to give me a thrill. Larger than life, I’m transfixed. I tumble flat. Reaching for Henry Miller: “In Paris, on the asphalt, I have often walked saying: wild, wild, wild. You just say it, and walk, walk, walk. It makes everything rise, swell, burst. Then I am so happy I cannot bear it any more and I begin to sing. It is cause for bliss. You can get drunk on walking.” Oh, Henry! This week, as a follow-up to my salute to the Hôtel Ritz Bar, I’m sharing a few more old-school apéritifs—along with touring suggestions to go with your drinks— guaranteed to help you ease into the “l’heure de l’apéro” in harmonious style. I’ll also shine the spotlight on a few of my favorite bars in the city. All three flaunt retro charm, so let’s walk, walk, walk. Let’s fall in love. A tall tale I often spin: In 1885 Fernand Muraux discovered a recipe in Switzerland and introduced Suze (named for a Swiss river). A gentian-based apéritif, this old-fashioned bar favorite is normally served on ice with equal parts water or orange juice. It’s peculiar flavor also plays well with grapefruit or cranberry juice. Because everything tastes better in context! Before sipping your cocktail, work up a thirst with a stroll around Montmartre. Here you’ll find Picasso’s studio at the Bateau Lavoir at 13 Rue Ravignan, Modigliani’s flat at 7 Place Jean-Baptiste Clément, Van Gogh’s old digs at 54 rue Lepic, and the Chat Noir at 84 Boulevard Rouchechouart (where Erik Satie himself once tickled the ivories). Back in 1912, Suze played muse to Picasso. The artist quipped, “I put all the things I like into my pictures—too bad for the things, they just have to put up with it.” Hands-down, his collage “Verre et bouteille de Suze” still rises above the heap, in my book. Still parched? The Musée Montmartre (12 rue Cortot) features a 19th century bistro, outfitted with an old zinc bar, while the collection of the Musée de l’érotisme (72 boulevard de Clichy) fully embraces the history of brothels in Paris. Open until 2 AM. And yes, there’s a gift shop here, too. For that “special someone,” of course. If quaffing a drink while shooting the breeze with animated locals is a dream, Chez Ammad (at the Hotel Clermont, 18 Rue Véron) is your joint. Though located just a few blocks from the hustling, bustling Place des Abbesses, you’ll spot nary a tourist in sight. Cheek to cheek, this place is the real McCoy. Setting the scene: Adorned with a zinc bar, murals, and beveled mirrors, Chez Ammad once tempted the likes of Henry Miller, Brassaï, and Edith Piaf! 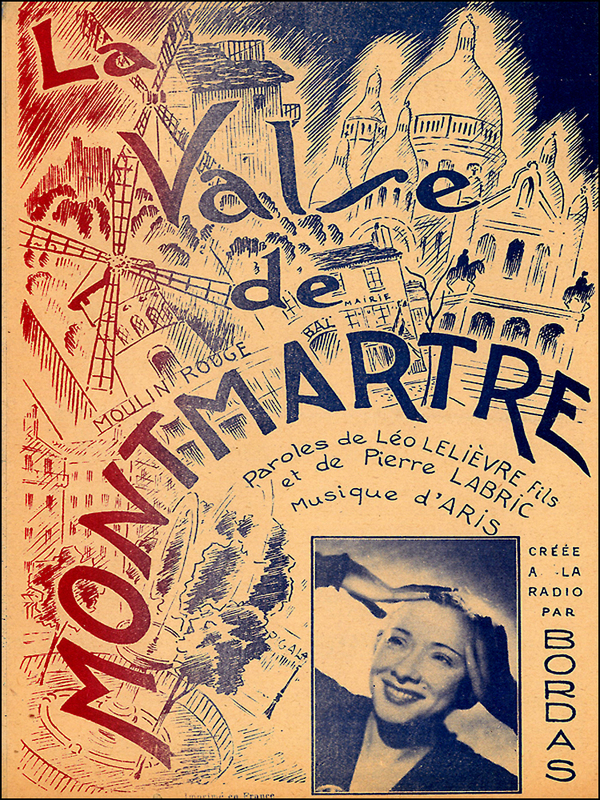 (Edith actually stayed at the Clermont in the 1930s, while performing on the streets of Pigalle.) Clank a few cold’uns with sea merchants, clowns, lovers, off-duty velvet-clad cabaret performers, artists, poets, and musicians, each with tales to tell! Also, try Ammad’s house couscous. They’ll post a sign if the pot’s on the stove. Bon Appétit! Hankering for a taste of the past? Order a Picon bière. Spilling all: Created by Gaétan Picon in 1837, this bittersweet blend of oranges and blue gentian flowers is served with a demi-pression (a draft beer), into which you pour the Picon. Aromatic and richly colored, the orange-toffee-flavored brew combines with the hops to pack a power punch. So pace yourself! Let’s now hop on over to Le Supercoin at 3 rue Baudelique. Located on the back side of Sacré Coeur in Montmartre (two stops from Chez Ammad and Métro Abbesses), it also shimmies with pizzazz. If it’s a pleasant night and you are wearing comfortable shoes, I suggest hoofing it there. It’s about a twenty minute walk over the hill (but there’s lots to see along the way). Take a breather on the steps of Sacré Coeur. This is one of my favorite views of Paris. Do keep your hankie and camera in hand! Blue skies suit the wedding-cake basilica, but she also glows at dusk. Back in the day, the then new Neo-Byzantine stunner helped kick off Cubism by rousing both Picasso and Braque. Both were driven to paint Sacré Coeur in all her fragmented beauty. Braque could see her powder-white towers and turrets from his studios at 101 rue Caulaincourt and 48 rue d’Orsel. Rocking a funky vibe and a micro-beer menu that won’t quit, Claudia Lerin-Falliero’s Supercoin is decked out in eclectic art and retro posters. I spied Elvis and Clark Gable hobnobbing with The Smiths and a paddle of rubber duckies. More to the point, the joint is cozy, and Claudia’s signature “Tartine savoyo-comtoise” (cheese and sausage) with a salad costs just 5 euros. Stéphanie Lebiez (Supercoin decorator) recommends the “moelleux au chocolat” (chocolate cake). I agree. My eyes have seen the glory. Frankly, Scarlett, you’ll never go hungry here! Get Crafty: Ask for a beer menu, created by Claudia and Yohan Loiseau (beer connoisseur). Here are Yohan’s current picks: the Franche Profonde (La Franche), the Sorachi Ace Bitter (Mont-Salève), and the Cuvée d’Oscar (Craig Allan). Got a question? Ask Claudia. She knows. Beer selection cha-changes with the season. So just go with the flow! While exploring the Marais at l’heure bleue, I recently discovered Le Sévigné at 15 Rue du Parc Royal. Located next to a garden, its terrace was the perfect spot to watch the sunset. Before relaxing, I advocate a whirl through the Musée Carnavalet (where you’ll spot Steinlen’s original Chat Noir Bar sign!). Also, Victor Hugo’s old digs are just a cobblestone away at 6 Place des Vosges. 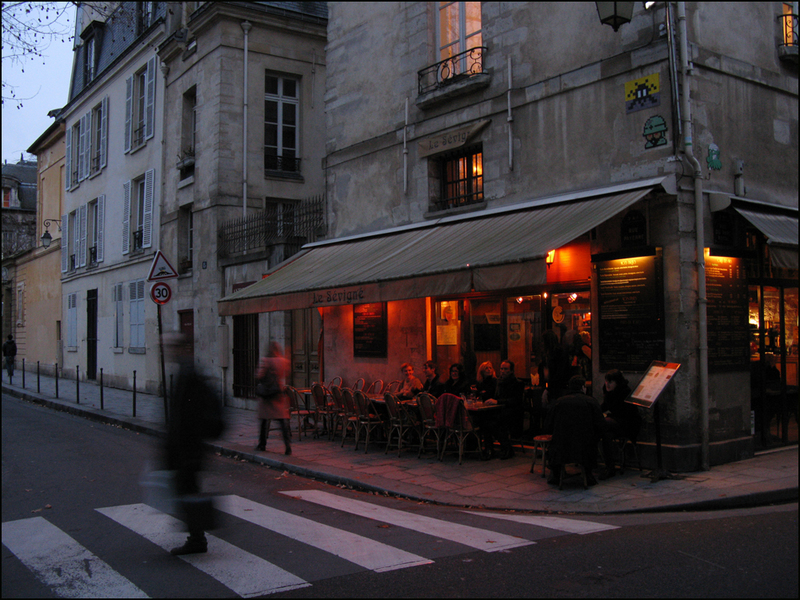 Tip for the road: Paris has beaucoup bars and cafés, picture-perfect for your very own stardust memory. 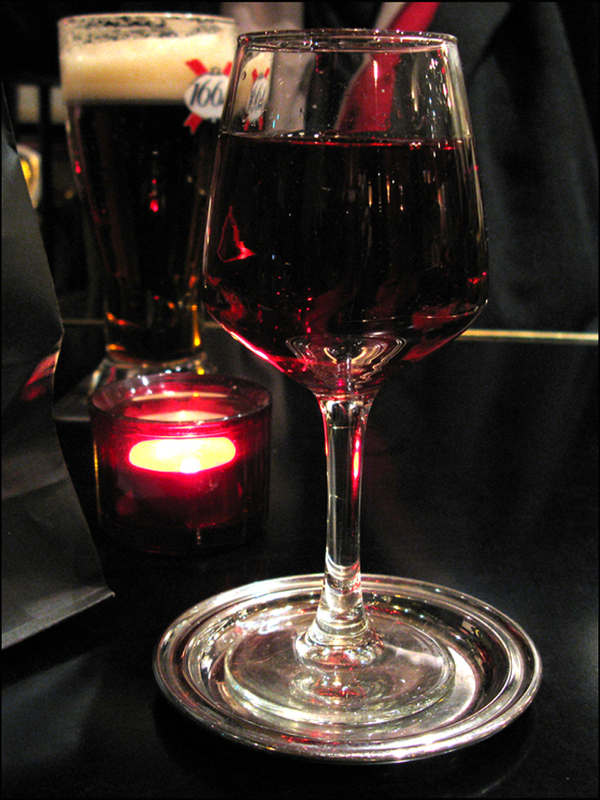 So while in Paris, stop and smell the rosé wine by the glass. Pack the camera and the sketchbook. And don’t forget Ritz bartender Frank Meier’s credo about what makes a great bar truly great. It’s not the drink recipes, he said. And it’s not the décor. It’s the people. Cheers! I was so ready for a short trip to Paris. Thanks for helping me get there. I want to try those beers!! I know! I know! Janet, Yohan is my beer guru. I plan to feature him in a few more posts. He’s also a film and television editor. Yohan does his homework, spending time with the breweries and brewer masters—worldwide. Plus, he’s charming! Each beer on the Supercoin’s “Carte des Bière Artisanales” gets tested, re-tested and described in detail. La Petite Princesse Bière de Table by Thiriez (Nord-Pas-de-Calais) and the Jester King Brewery (Texas) is one my favorites. At the moment, the bottled collaboration is only available in Europe. But that could change. Great name, taste and label! Do you have a favorite beer in the world? Or beer joint? My default beer is Guinness but I like to try other beers. I like darker beers that aren’t too hoppy. No particular beer joint right now as I don’t have time to go anywhere to drink. 🙂 Too busy getting the house ready to put on the market. Very, very close. Theodora, would you send me an email so I have your email address? I have something to ask you “off the record” as it were. Nothing bad, BTW, but I don’t have contact info for you. Thanks! (If you don’t have an email address on record, let me know and I’ll get it to you. I sent you a message on FB. Since I’m not your FB friend, it went to you other place. Take a look and then you may contact me through FB. That’s probably just as easy. Thea! Who knows Paris better than you? You pack so many juicy details into every post and bring something for everyone no matter what age. My Paris file is overflowing with your posts. With your permission I’m going to reblog this later in the week … it’s just too good! Un Picon is a big favourite of mine! Good. Golly, Patricia! I’d be honored. I’m flattered, really!! Thanks for spreading the word. I really appreciate it! It was a fun post to create. Blushing now as I type this. Again, you made my week! 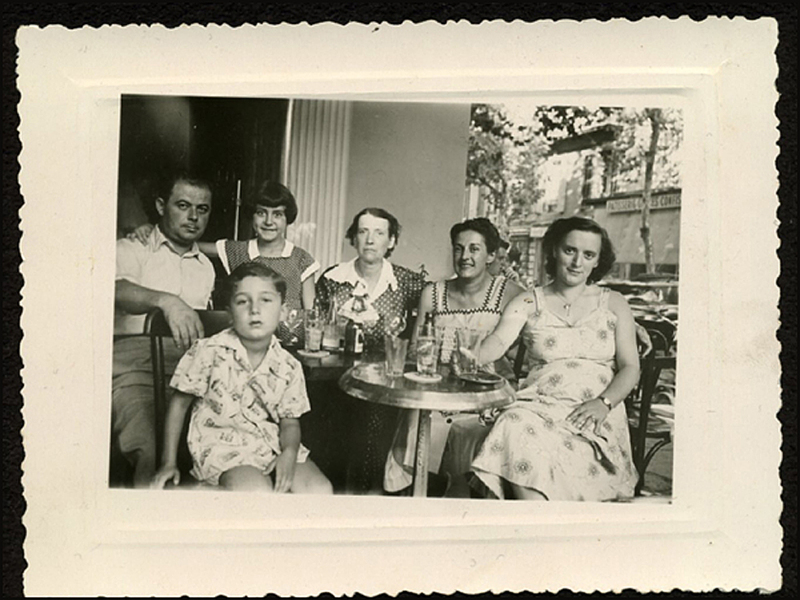 I’d love to find more summertime café photographs at the flea markets. It’s so interesting to study the drinks on the tables, along with body language and expressions. Ah, the tall and cool Picon Bière. It’s a great way to kick-off a summertime shindig in the shade. Gorgeous color! Do you have a favorite beer? Did I mention one of my sons is a brewmaster? Very cool! Where? Do spill! T.
OH, Virginia! I’m also mad, mad about the silver dust of Paris. Wilde, Wilde, Wilde—indeed! I love it. In fact, sometimes I don’t clean and polish my shoes after strolling through the Jardin des Tuileries. Instead, I draw little hearts and re-play the day. My ritual. My confession. I also loved your KIR-ageous drink description. Do you have a secret recipe? Enjoy the weekend! T.
I have Stuffed on order. I thought being a retired restauranteur it would make a good read. I am half way through Vok’s My Dear Friends. It’s a quick read. Great for a summer day. I make my Kir-ageous drink by splashing in the cassis until the wine is the colour of a glorious sunset. V.
I will race you there! It’s a sweet-looking house. Modigliani also lived with Picasso and other artists at the “le Bateau-Lavoir.” Located just around the corner, it was an old piano factory, converted into artist studios around 1880. More tidbits! Here started experimenting with sculpting heads with railroad cross-ties stolen from the Barbès-Rochechouart Metro Station, which was still under construction at the time. His very public and spirited fusses with girlfriends Beatrice Hastings and Jeanne Hébuterne at Place Emile Goudeau are still legendary. Tales are still told! Oh, la la. Your posts are always so evocative – I feel like I am there already – perhaps it is because I am hanging out for a Paris fix – thanks for keeping it alive for me until next year! YES. Add the Abbesses-Montmartre to your list! I’m currently creating a post about my favorite places to eat in the area. So stay tuned! Even the historic Studio 28 at 10 Rue Tholozé has a lovely patio, perfect for drinks and snacks before or after the movie. A scene in the movie “Amélie” was shot here at the theater. 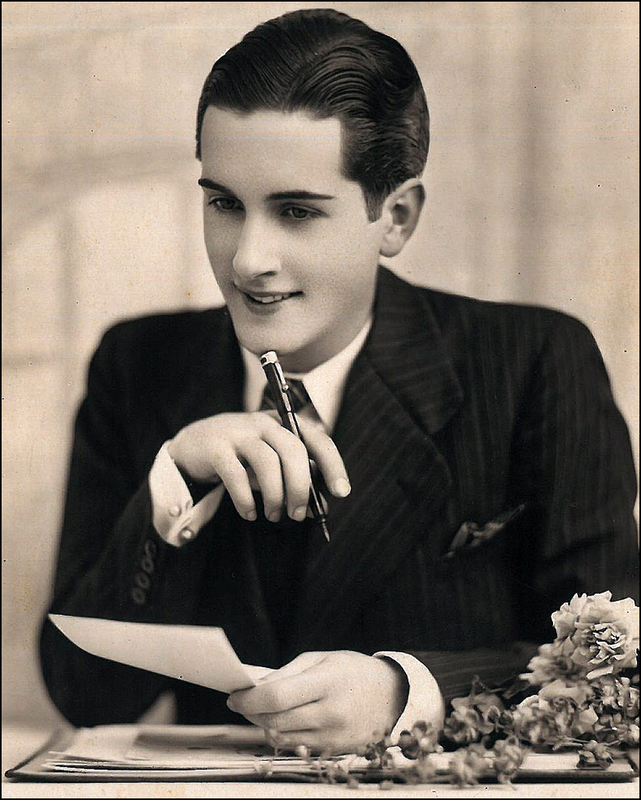 Founded in 1928 (hence the name), it was one of the world’s first avant-garde art theater. Here is where Salvador Dalí and Luis Buñuel premiered one of the first surrealist films there: “L’Age d’Or” (The Golden Age)! Wonderful post. Its like being there with you! Thank YOU. As always, I love your words. I am beaming, now!! T.
Every time I stop by, I want to hop on the next flight over to Paris! Thanks! Thank you! By the way, I loved your recent nod to New York City architecture. Your shots of the facades were beauties! Gorgeous. T.
Great post – Paris is magical! I’m with you, Kim!! Do you have a favorite terrace in Paris? Le Saint Jean at 23 Rue Abbesses (Métro Abbesses) is a great spot for people-watching. I also dig their chicken salad! Fab as always – thanks! Wonderful photographs of our beloved city dear friend… and that quote of Henry Miller… well… what could I add? 😉 a splendid post! You always manage to satisfy and stir longings at the same time with your lovely posts – more to add to the “must see” list! That is just what I needed to hear today to change the mood as I was a little miffed this morning…. This is my second trip to Paris today 🙂 Great post! Thanks for joining us on the trek! The Marais is also one of my favorite ‘hoods. Forgive me if I’ve asked you this before. While you were staying there, did you have a favorite café? I love the little chocolate near to the Saint-Paul Métro entrance. Oh, la la. . .T. What comes to mind is Chez Janou. There’s also a cafe under or near the Victor Hugo Museum. there’s Les Philosophes for small things. I also remember a lot of falafel places. It’s great if you enjoy falafel. Thanks for the leads! Chez Janou at 2 Rue Roger Verlomme looks dreamy. I love the posters and giant clock on the way. Jotting down the address, now. I’m looking forward to checking it out. I also love at Les Philosophes 28 Rue Vieille du Temple. Another excellent choice. Plus, it’s located next to Victor Hugo’s old digs. One of my favorite museum houses in Paris. I love his whimsical furniture. Incredible!! T.
Henry Miller was one of my college crushes. It’s good to hear his words again. Your insider posts so whet my appetite for Paris–but a trip where one stays for a while to experience the place at least a little like you do! If I can’t be there, your blog is the next best thing! Thanks. 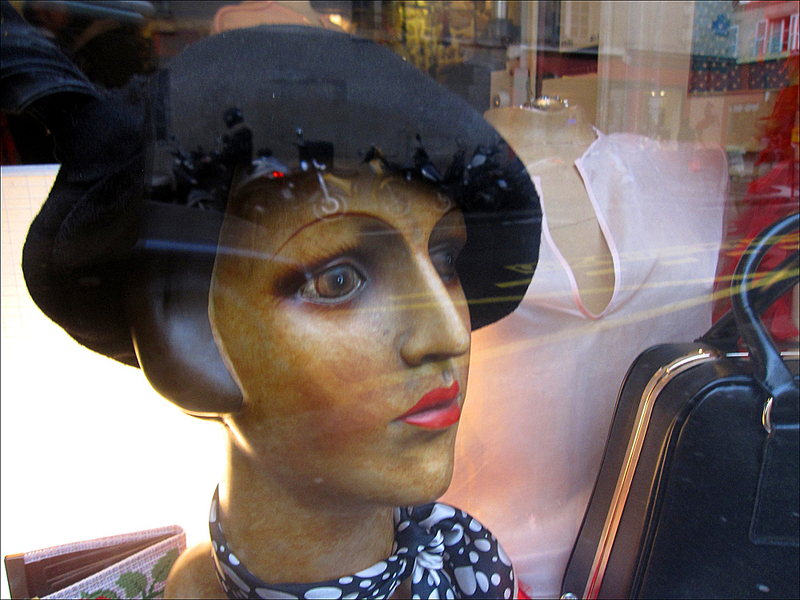 Do tell more about the vintage shops in Marais and Montmartre! Hi Gayle! I still have a crush on Henry Miller!! I adored reading “A Literate Passion: Letters of Anaïs Nin and Henry Miller 1932-1953.” (1987) Gorgeous, voluptuous passages! 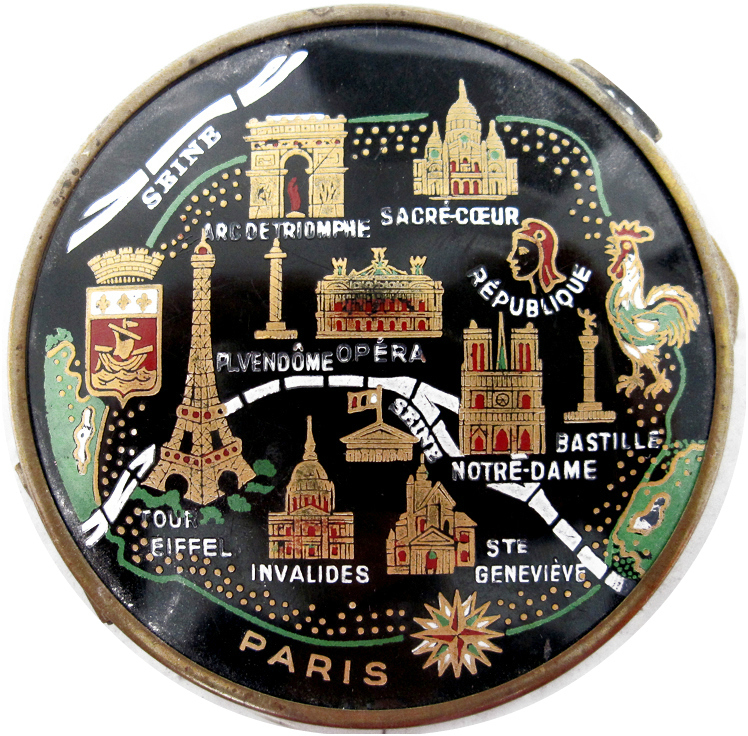 They include such wonderful, wonderful details about their travels and life in Paris. Oh, Henry. Also, thanks for your kind words. And YES. 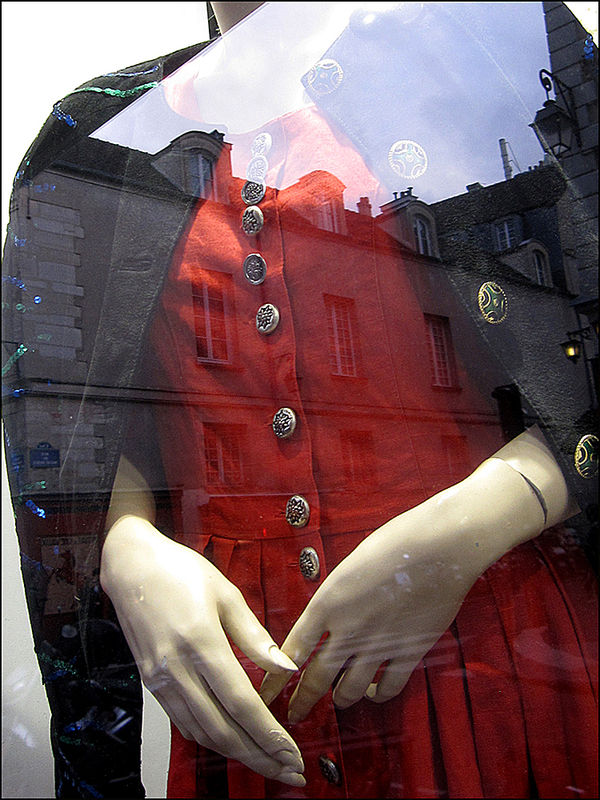 I’ll create another post about the vintage clothing scene in Paris. The big summer sale is just around the corner. Thanks for the push! Super post, T! I wish I was in the Marais, not stuck at home in Beckenham. And Supercoin sounds fabulous. I shall just have to live vicariously through your posts. Thanks, Richard! The Supercoin and Chez Ammad are both pretty darn fabulous with glass fronts and dramatic, funky lighting. You’d have a field day at both bars, snapping, snappy your street portraits. Do you have a favorite joint in Beckenham? Have you taken photographs? T.
Yes, I’m sure I’d love both of them. Yes, I do have a favourite place – it’s a little deli/ cafe that opened a couple of months ago. Next time I’m in, I’ll ask…thanks, T! Oh, my gosh! I haven’t had Kir since the mid-80s, when members of the Milwaukee Ballet Company corps used to frequent a bar near their studios…we’d all (techies and dancers, even the prima ballerina) become real people again, under the magical Kir–it was wonderful!!! Merci, Mlle B., for bringing me this great memory! 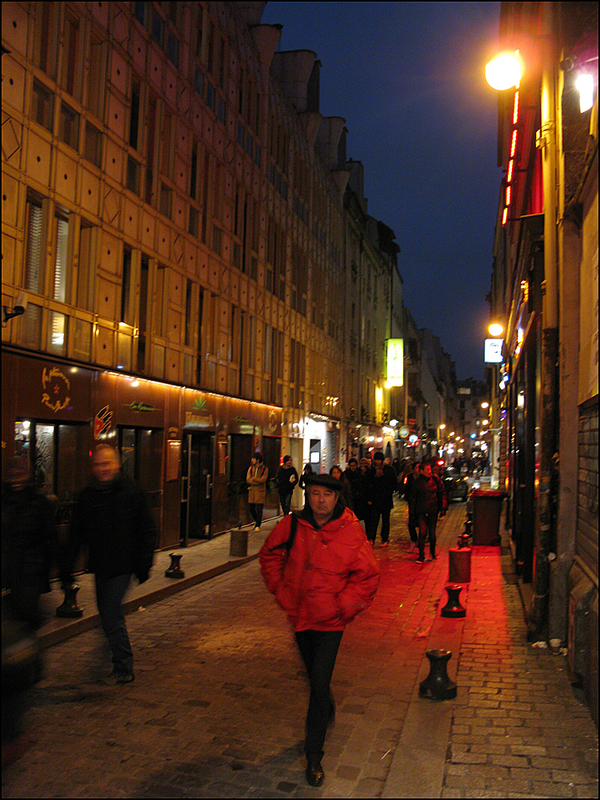 Your images here are some of the loveliest, most romantic peeks at Paris…some, almost Van Gogh-esque, with their bright yellow lights, and deep carmine reds! I just watched the DVD of Kirk Douglas playing Vincent (a MAG-nificent performance! in the 1956 “Lust for Life”–tears flowed for this poor, now long-gone, brilliant man! AH!! I loved your “Kir story.” YOU should write a book. Or perhaps you’re working on it? Were you also taking photographs at the time? Also, thank you for your thoughtful words! Yes, I dig playing with reflections. Cooking up a post now about window-shopping. 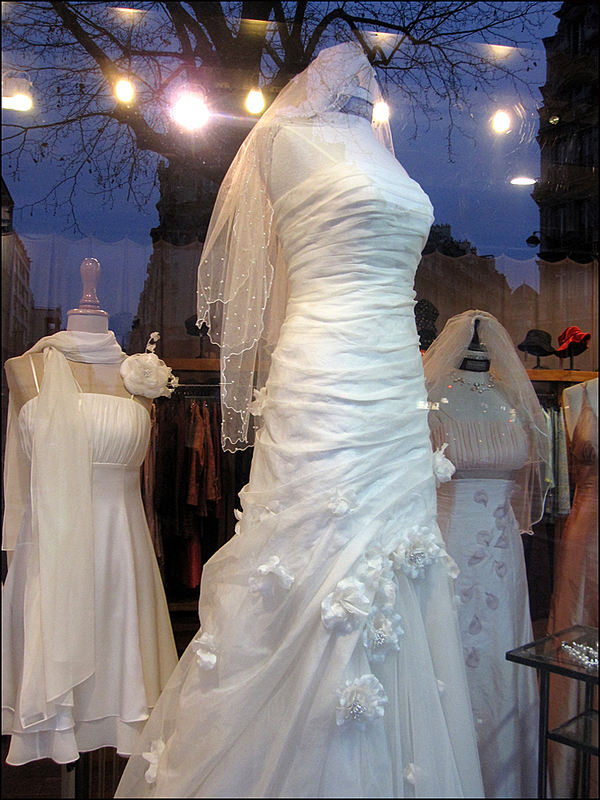 During your years as a window display artist, did you mesh your designs with the reflections of the sky and surrounding buildings? Not really, as some of it was “design by committee’, Mlle B., if you know what I mean? Also, in my work with vitrines, some of my designs were thought to be a bit ‘outre’ for these mediocre personages (bosses), but I worked my way around them, and always came up with something fresh–after I did a lot of ‘sweet-talking’! By the way, I’m visiting Ireland in a bit–watching the John Wayne/Maureen O’Hara classic, “The Quiet Man”…one of my all-time faves! Ah, the Quiet Man! Another winner! I also loved Maureen O’Hara as Esmeralda in the 1939 “The Hunchback of Notre Dame.” I adore old films! B.
Gee, finally ‘found’ this comment, Mlle B.! WP is acting silly lately! Yes, she was marvelous in “The Hunchback”–matter of fact, she’s been great in every film of hers I’ve ever seen! Personally, I really get into a lot of old ‘noir’! By way of introduction, my name is Jilly (aka Biscuit and the Singing Songster; a moniker extened me by Tin Man) Virginia happens to be my dearest friend. It is through her that I have come to read your blog religiously and always with great interest. I felt compelled to comment today because of your talk of the silver dust of Paris. I have a secret which is about to be no more that is: on a windy day when outside the Louvre, it became apparent that the dust had permeated my sweater. Since my arrival home two years ago, I have been unable to wash that sweater because of the silver it holds. I feel I am wrapped in Paris when it is worn. Fortunately, no one knows of this otherwise they might have concerns regarding my eccentricity. I have a feeling that you, Tin Man and my Virginia would understand. May a lovely day be yours. Hello, Jilly (aka, Biscuit and the Singing Songster)! I also adore Virginia and the Tin Man. They certainly make my world a warm and glamorous place. In living color, of course. I feel very lucky! Goodness. Gracious. Your story gave me goose bumps. Thank you for sharing your secret. I won’t tell a soul. Mum is the word. For the love of mana, I completely, completely understand. Don’t ever wash it. Oh, no. I’m with you! Clothing stimulates and acts as mirrors, reflecting our past and spirit. Invoking all senses, we’re able to delve deep and travel far. I have boxes and boxes of these mystic tokens. Perfect souvenirs. Confession: today I’m wearing my “lucky” shirt. I had just purchased it on the Magnificent Mile, before meeting the mayor (before he became mayor) at an art opening. Whenever I’m blue or need a lift, I throw on the jersey black top, and it transports me to that very icy cold day on Michigan Avenue. Thanks for the chit-chat. And do keep the sweater away from the soap bubbles! What a rich and delicious post, my friend. I’m afraid I have a contact buzz! MERCI. And thanks for shooting the Passage des Princes at 97 rue de Richelieu for me. Beautiful shot!! T.
Deano, I loved your Washington D.C. report. I got chills. It was quite moving. I loved how you captured the statues and their expressions. Even Abe Lincoln. Einstein, too! Not an easy feat! Bravo. T.
Gorgeous wedding dresses! Great pics as usual. I found your wonderful blog while doing research on Paris flea markets. I will be in Paris at the end of the week and can’t wait to sit somewhere magical and have a leisurely drink. Thank you for sharing your insight! The stroll and the Suze for me! Thank you for reminding me of two of the most wonderful trips that I’ve had….both to France and the month that I spent in Paris….unforgettable! Looking at your pics make me want to pack my bags right now!!!! Have you ever been to Caves de Reuilly? A fun, casual neighborhood caviste with a huge terrace and a young, friendly staff with great wines of course. I almost forgot to mention that I got a pair of Repettos recently for USD$25 at a BHLDN sample sale. I was beside myself, and had I had my wits about me, I’d have gobbled up the rest of the sample Repettos and sold them on eBay! such heartfelt excitement & joy — I want to go back today! also thank you for making me seek out Verre et bouteille de Suze — it’s beautiful. 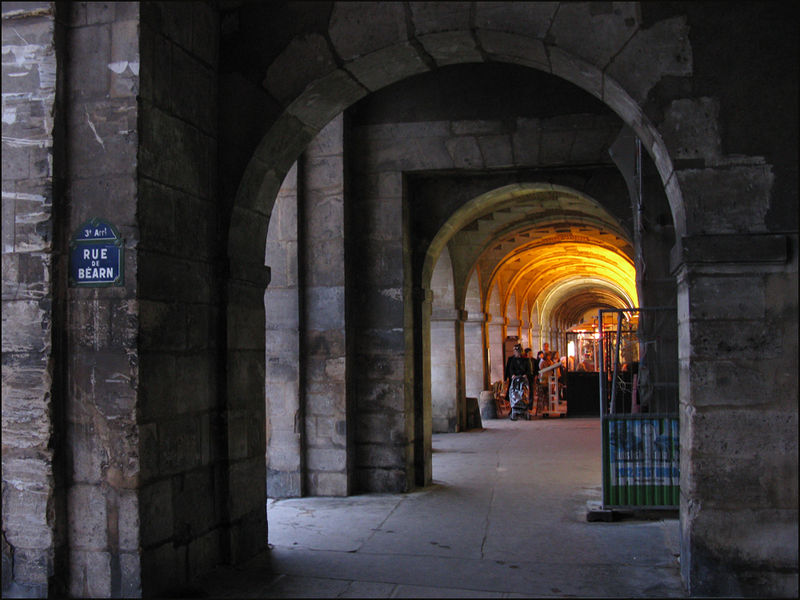 That photo of the arches in Marais…[I will insert an adequate adjective when it comes to me]! As you can imagine, THIS post will come in terribly handy for “saucy” ol’ nicole*…nothing I love more than a boite (did I use that correctly?) with the perfect ambiance! A cocktail and I flip the page on my notebook and the ink will fly! 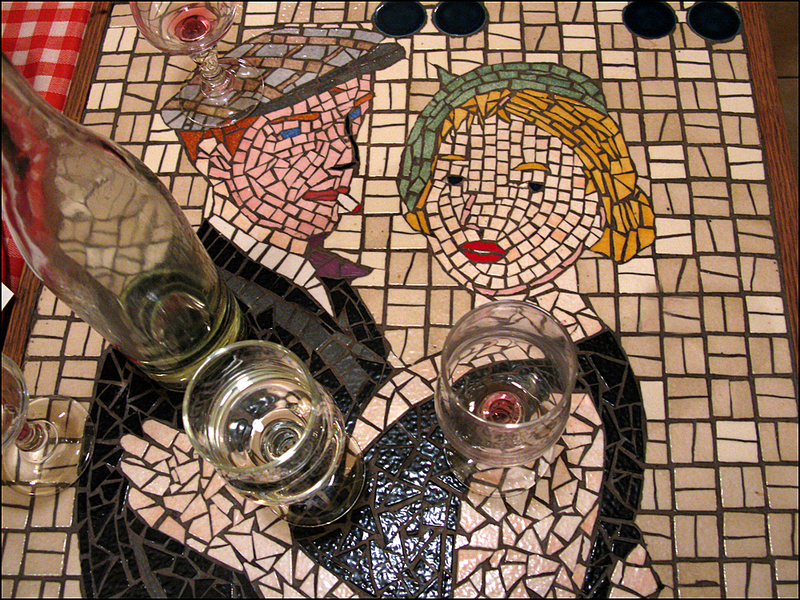 I love the table at Le vieux Belleville at 12 Rue des Envierges!! It’s been twenty years since I have been to Paris. I always thought it the world’s most beautiful city. I will only grudgingly admit it is more beautiful than Rome – being Italian.